This photo show a float going through Tilbury Town. In the middle of the photo is Valerie and Bernard Anderson aged about 10 years old. Can you name any others in the photo? 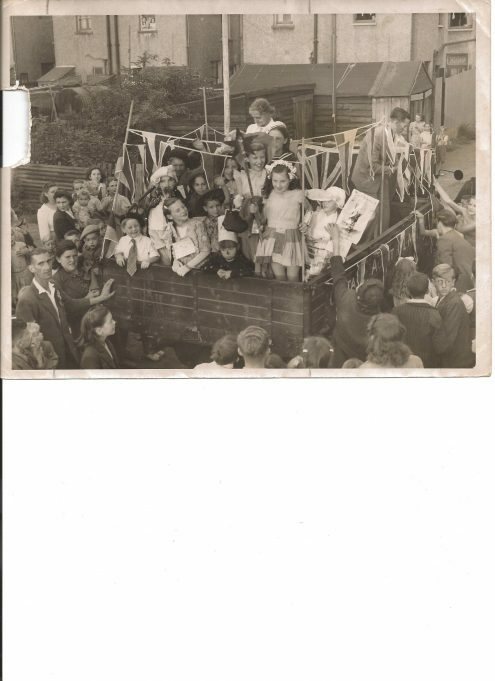 In the centre at the back end of the lorry is Maureen Clarke and to her right, is her sister June Clarke rear corner. I think the lad standing to the right of the truck with the glasses is Jack Russel. I think he lived in Stephensons avenue. I worked with Elsie French at London Transport in the 1960s.I was a conductor and she was a conductress I knew her quite well A lovely lady she was too. Thank you for putting the photo on it definitely brings back memories of Tilbury for me. Though I still live here don’t matter what people say I still like it. to be honest I don’t think it is my mum as she was definitely brought up in coopers shaw road in gravesend there were lots of children and what a coincidence she had a brother called John who died a few years ago. And we lived at number 12 Stephenson for many years until 2010 when my mum died of cancer that is very strange. The lady to bottom left is definitely Elsie French. Elsie was my Auntie and looked very much like my dad Harold. Elsie worked on the buses for many years I recall. She was raised from the circle at Tilbury and Stephenson Avenue but never knew she was born in Kent always thought born in Tilbury.